One of the first settlers to the Deadman Bay area was James Howard Stephens, who had been a private in the Florida 9th Infantry, CSA and had been farming in Hamilton County. Stephens's new objective was to establish a timber procurement operation to feed sawmills in Cedar Key and their steamboat transport of logs and lumber to ports in the northeastern states. The cypress and cedar logs were configured into large rafts for transport down the coast to Cedar Key. Aside from fishing and small plot farming, there were little ways to support the area settlers. Most of the trade for Taylor County was through New Port on the St. Marks River. Soon the collection, processing and marketing of marine stores began to thrive. Commercial fishing gradually increased. It is unclear when the first sponge fishermen came to the area but further south at Cedar Key and Tarpon Springs the industry was thriving. 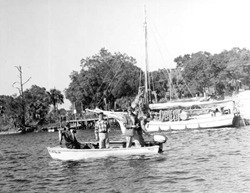 By the 1930's sponge fishermen were well established in Steinhatchee. There were two sponging methods utilized by local fishermen. The hook spongers were the first to come to the area and worked in a rich wool sponge fishery around Rock Island. The hook method utilized a glass bottom bucket with a fabric hood that covered the head, blocking reflection, while looking for sponges on the bottom and collected by hooking. This method was used in shallow waters and hard-hat divers fished deeper water further off shore. Hard-hat fishermen were forbidden to enter waters that were designated a hook fishery. Local residents during that period say it was common to see anywhere from 50 to 100 sponge boats moored in the river. The industry declined and ended in the late 1950's as a result of disease along the gulf coast that killed the most sought after, sea wool sponges. Following WWII, Steinhatchee adjusted to the changes which were occurring in America: a more mobile society with expendable income for leisure activities. 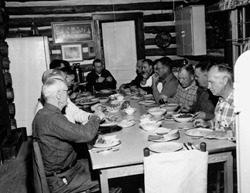 Fish camps began in Steinhatchee, with one of the most upscale being the 'Shangri La Lodge.' 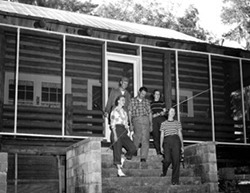 The lodge was known for its superior facilities, staff and fine dining. 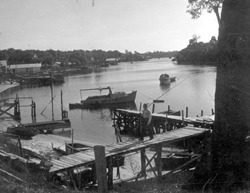 From Steinhatchee's beginnings, the core industry and activity was related to fishing. Survival in this coastal area was heavily dependent on salt mullet, a staple for survival. Commercial fishing was the mainstay for most residents. Many species of fish, particularly mullet and trout, blue and stone crab, scallops and sponges were harvested for markets around the country. In the 1940's thru the 1960's, mullet and their roe were salted and sold throughout the southeast. Motors were uncommon for most resident's boats until the 1960's. A gradual boom developed into what had been an area of unknown sales potential, the marketing of mullet roe in the mid 1990's. The Steinhatchee commercial fishermen not only met this demand locally, but also expanded by buying and selling from Alabama, Mississippi, Georgia and South Carolina. 1837 -- John Lee Williams labels the river as "Achenahattchee." 1838 -- Fort Frank Brooke was constructed. 1840 -- Fort Frank Brooke was abandoned. 1845 -- Florida became the 27th state of the Union. 1856 -- The southern two thirds of Madison County became Lafayette and Taylor Counties. 1860 -- Steinhatchee's first county census totaled 1,837 residents. 1872 -- James Howard Stephens bought the first property along the River in Steinhatchee. 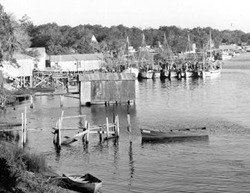 1930 -- Sponge fishermen were well established in Steinhatchee. 1935 -- Infamous Labor Day Hurricane flattened the larger trees for miles and thus was a boon for local timber harvesters and mills. 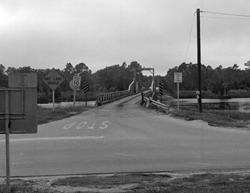 1948 -- The first Steinhatchee River bridge was installed. The bridge was a military surplus "Bailey" bridge that was barged from Scott's Ferry in Calhoun County. 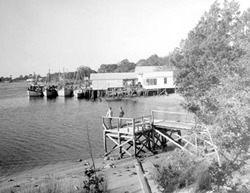 1950 -- The end of the sponge industry in Steinhatchee as a result of disease. Mid 1990s -- Marketing of mullet roe. By late 1995, regulation of the commercial fishing industry heavily impacted the economy of Steinhatchee. The hospitality industry in Steinhatchee continues to grow and expand. The fish camps, motor courts, motels and lodges are being replaced by rental apartments, condos and service industries such as boat rentals, storage and restaurants. The total commercial landings in Steinhatchee in 2009 totaled 710,314 pounds. The top three species of those landings were blue crab, black mullet and bait shrimp.